For the last number of weeks when I have not been in production mode on my Scrap Buster quilt, or hand stitching one of several boutis projects in process, I have been working on some new quilting and boutis designs. A new rose window design for boutis is almost ready to be transferred to fabric. 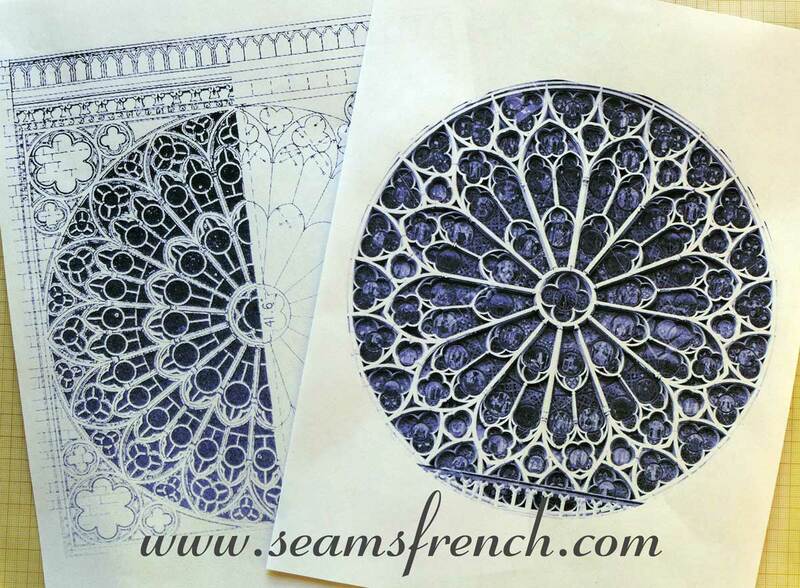 This time the design is inspired by the rose window in the south transept of Notre Dame Cathedral in Paris. One of my photos of the south transept rose window of Notre Dame Cathedral. 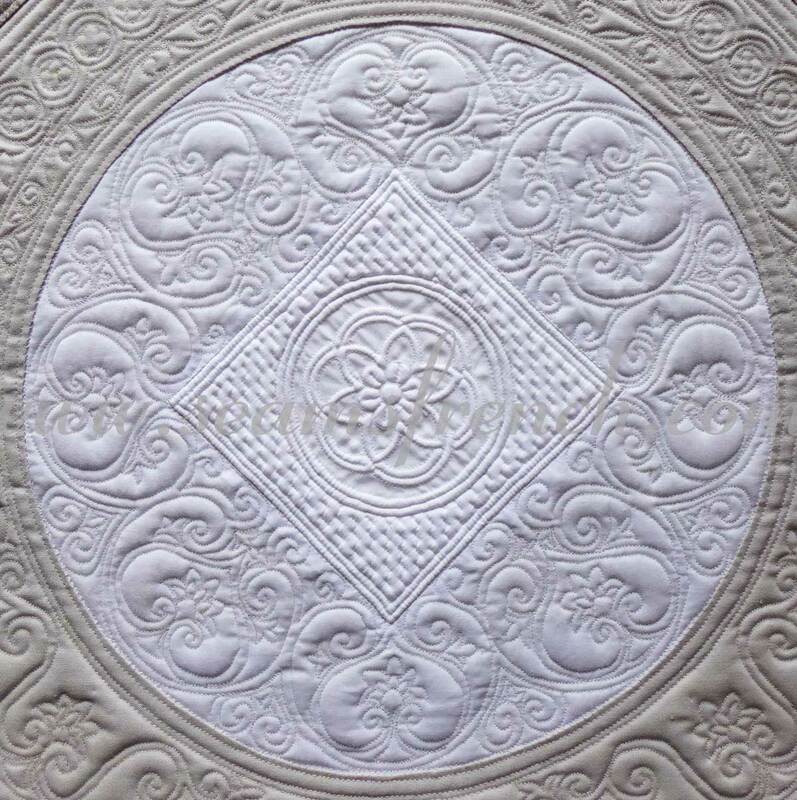 the idea to combine it with free motion quilting and create a larger wall hanging (below) came as an afterthought. The boutis is central to this combined machine/boutis wall hanging. I quite liked this idea and decided to try it again, this time making the window completely into a boutis piece. Using our photo of Notre Dame Cathedral as the basis for the design, my Autocad enabled husband has made a template that I can use to create my pattern. 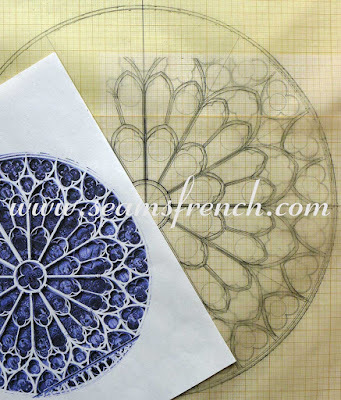 In the book, "How to Build a Cathedral", by Malcolm Hislop, Ivy Press, UK 2012 (ISBN: 978-155-267-571-7), I found a tracery image (below, left) of an original sketch for the south rose window. 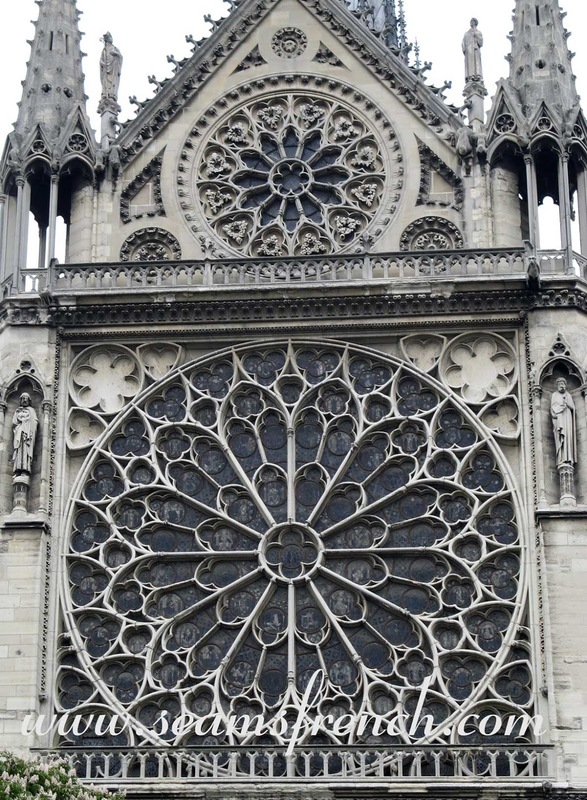 The "Paris Rayonette" style, as it was named because of the radiating lines from the center out, was popularized during the French Gothic period, and became the standard for many French cathedrals. The actual window that was constructed between 1250 - 1270 (below, right), was designed by architect Jean de Chelles and Pierre de Montreuil. It simplified the earlier design from 16 radiating segments, to include only 12 segments in the final build in 1260. I am referencing the original 1250 tracery because I like it's lacey characteristics. 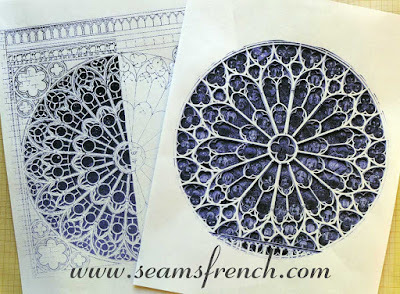 Both images are of the south rose window of Notre Dame Cathedral, Paris. The image on the left, taken from the book by Malcolm Hislop, shows the original 1250 sketch. The image on the right is from a recent photo of the cathedral and the basis for this design. Using the autocad drawn version of my photo as the template, I am in the process of creating the design. The first step is to trace the basic lines and create 1/8" (or less) channels. 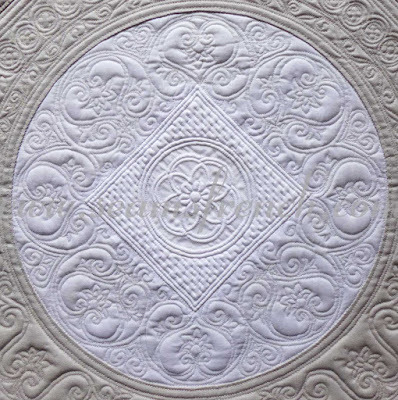 From there, I will add any other detailed design elements that I would like to include in my final pattern. This is the first of several boutis pieces that will become part of a larger wall hanging. This is going to be an incredible piece! I'm still amazed by the beautiful architecture and works of fine art that people created so many years ago. And we can all still benefit from them today in so many different ways. The human mind is amazing! You're absolutely right; there is so much inspiration to be found in the architecture and the art of all of these cathedrals. I spend hours in cathedrals when we're traveling, trying to absorb the depth and richness of the work and taking lots of photos, where appropriate and allowed. When we're at home, it's a great pleasure for me to revisit them through my photos and absorb myself in the details when I use them to make a design. Yes, this will be spectacular! I agree, the lacy effect of the original window is lovely, and I really like all the circles in it, too. How big do you plan to make it? Thanks Monica. 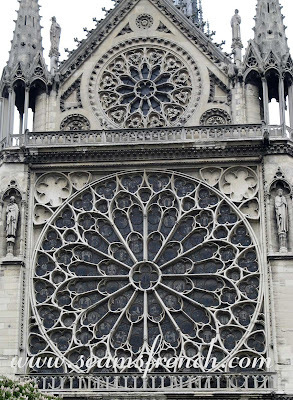 The diameter of the rose window is 12 inches. It will be set into a larger wall hanging, the size of which is not yet determined. 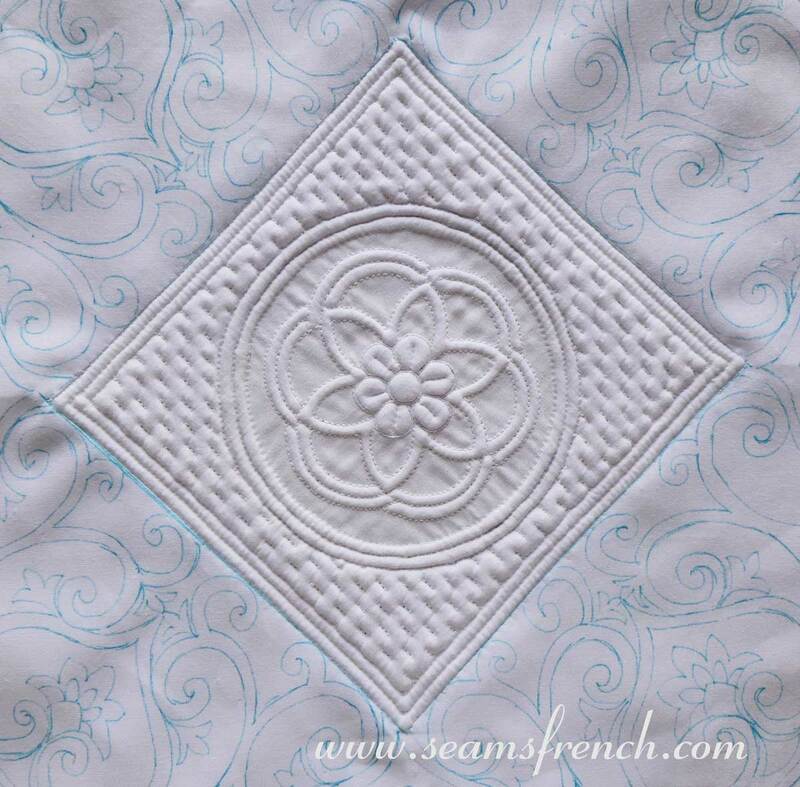 There will also be a smaller rose window as part of the same tower, but that is still a great many stitches away. This will be just lovely! I can't even imagine designing something like that. Thanks Cynthia. I find that the more I do it, the more I enjoy designing for boutis. The pieces are generally small and the design is usually quite straightforward. It's a process I have come to enjoy. Che meraviglia!!!!! Non vedo l'ora di vederlo terminato, sarà splendido. Buon lavoro!!!!!!!! !